How do You Fit into the Strategic Goals of Small and Mid-Sized Law Firms? The Managing Partner Forum just published its 2015 Survey of Smaller and Mid-Size Law Firms, the results of its March 2015 online survey of 165 law firm leaders (CEO, managing partners, chair, president, COO, or similar roles) from firms with 10 to 250 lawyers. Interesting, although 43% said their firm had no strategic plan and another 20% said that plan was in-progress, they nevertheless had a lot of confidence in their firm's future success (39% very confident; 33% extremely confident). Hopefully, the high levels of confidence combined with a failure to prepare for the future is not indicative of over-confidence! 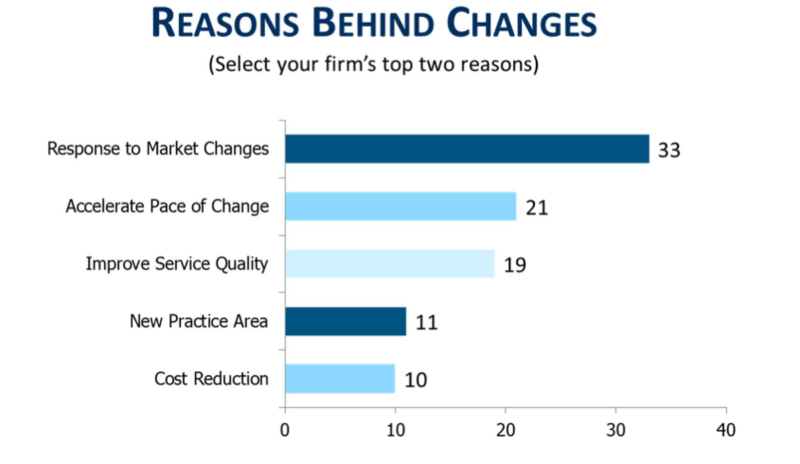 At any rate, 30% said their law firms have made major changes to their strategies. As always, as an individual lawyer, it's critical for your career success to understand how your law firm views its place in the market and to understand its values and strategies to move forward that market. So whether you're seeking a promotion, a raise, or new employment, know the top interests of law firm leaders. Think about how you fit into their goals and interests. And as you begin to your legal resume, LinkedIn profile, etc., be sure to demonstrate how you can advance the firm in these areas.